Finally after numerous road trips and two years of travel, we made it to the Grand Canyon. 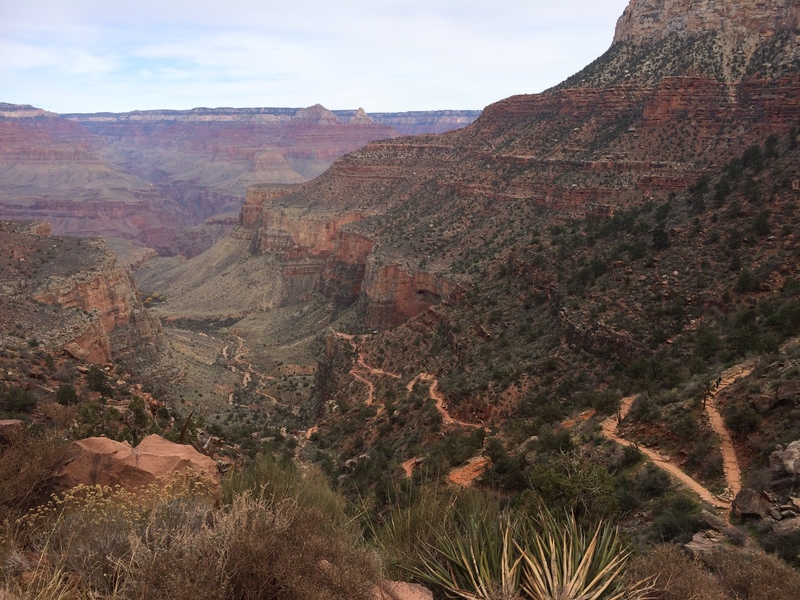 The Grand Freakin’ Canyon. 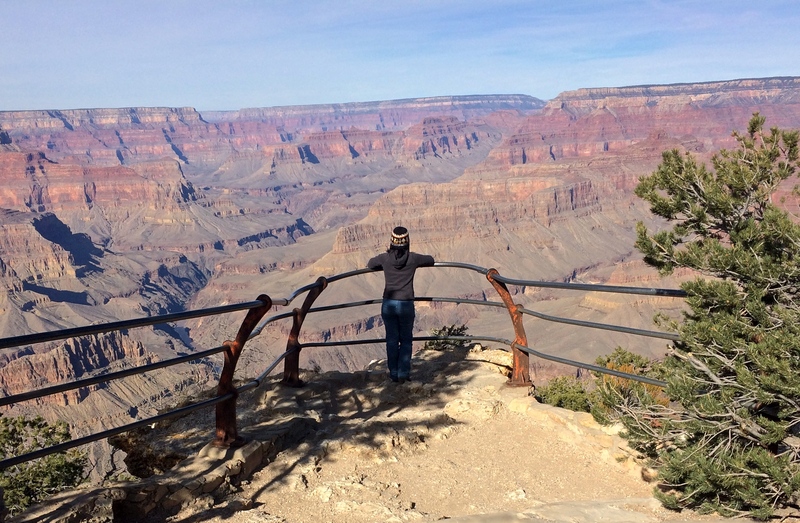 Because Yellowstone, Yosemite, and the Grand Canyon are the most popular and overcrowded national parks in the U.S., visiting them during the low season is key. It was early December and we were in southern Utah; we had no excuse to miss this natural wonder of the world. So off we went. 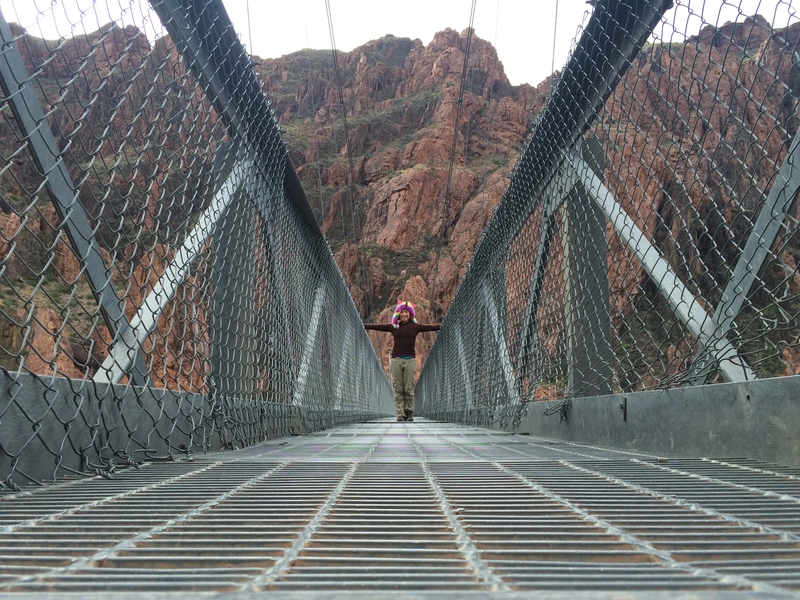 Chris had hiked down to the Colorado River years ago, and now it was my turn. Flowing through several states, the mighty Colorado River cuts and carves through thousands of canyons to create the Grand Canyon. 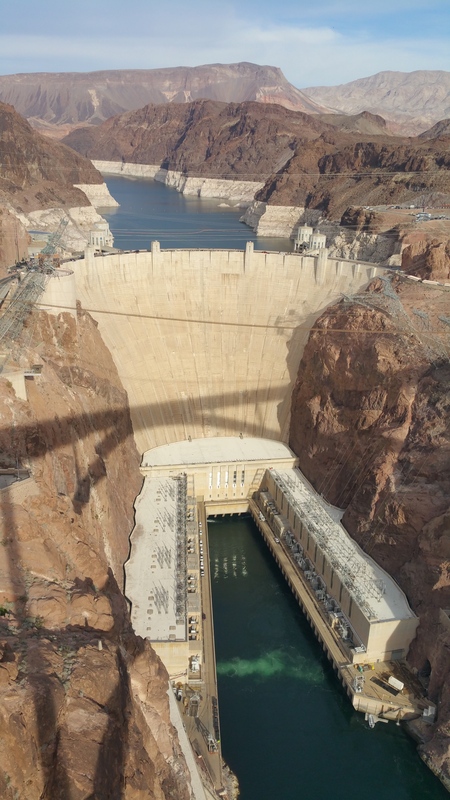 Situated in north-central Arizona, the Grand Canyon “starts” at Glen Canyon Dam in the northeast beneath Utah and “ends” at Hoover Dam in the west along Nevada. 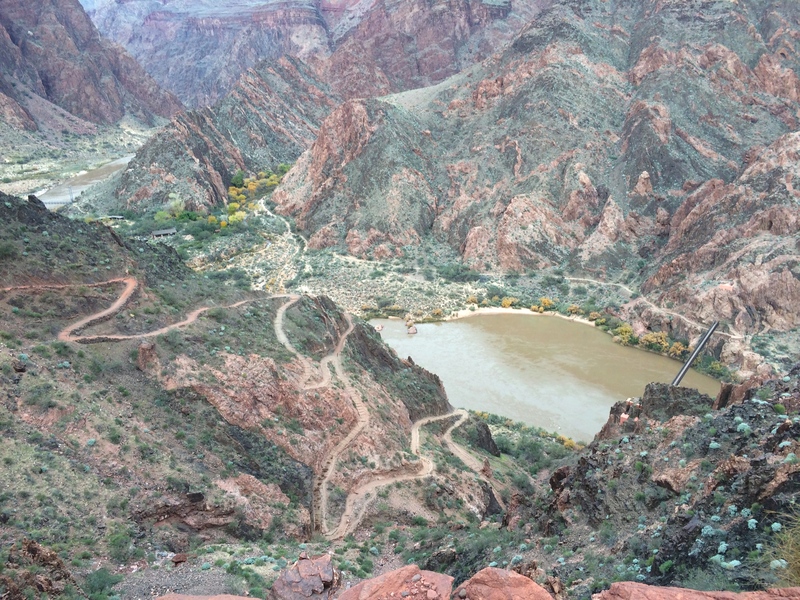 Between these dams lie the national park which consists a small portion of the north rim (seasonal from only May through and October) and south rim. 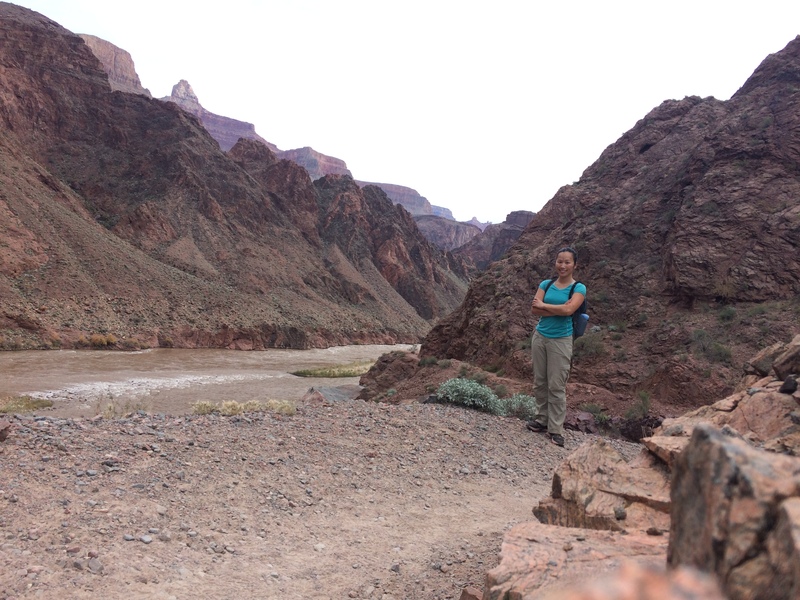 In addition to the national park are two Indian reservations that run their own services and charge their own fees: the Havasupai and the Hualapai reservations. We only had time to visit the national park. Next time we’ll drop by the Havasupai reservation. Before entering the Grand Canyon, we made a brief stop to Glen Canyon Dam. 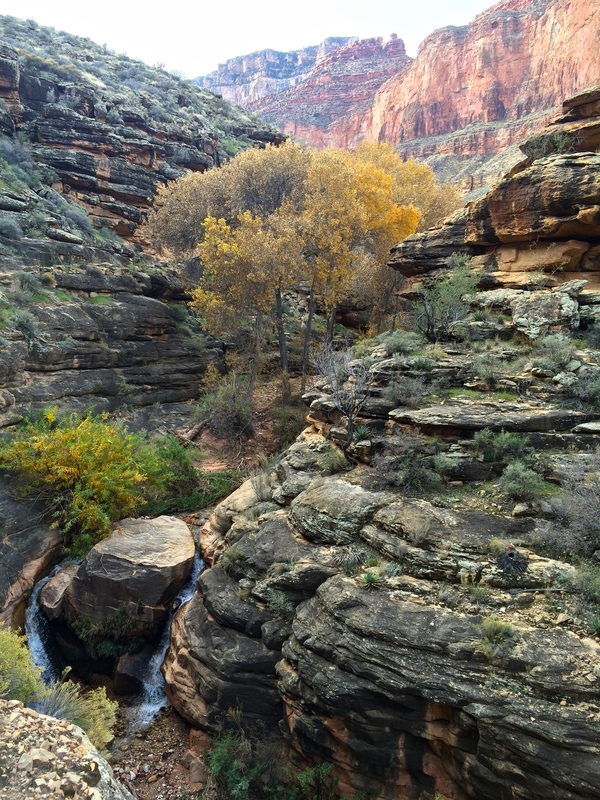 There, we were introduced to the preliminary waters of the Colorado River that would later carve the Grand Canyon. 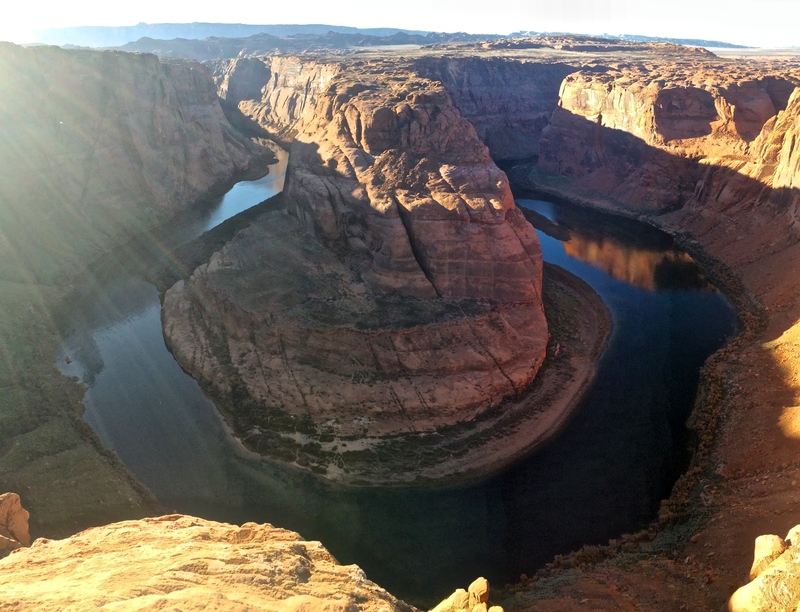 Just several miles south of the Glen Canyon Dam lied the Horseshoe Bend Overlook, a spectacular meander in the Colorado River. 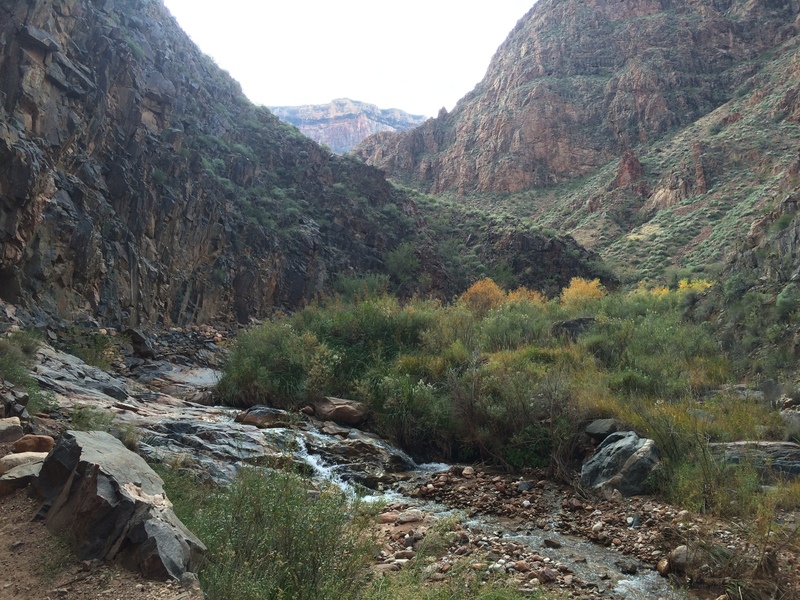 And this is where the Grand Canyon begins, I thought when I gazed 1,000 feet below into the river. Then off we went to the Grand Canyon. 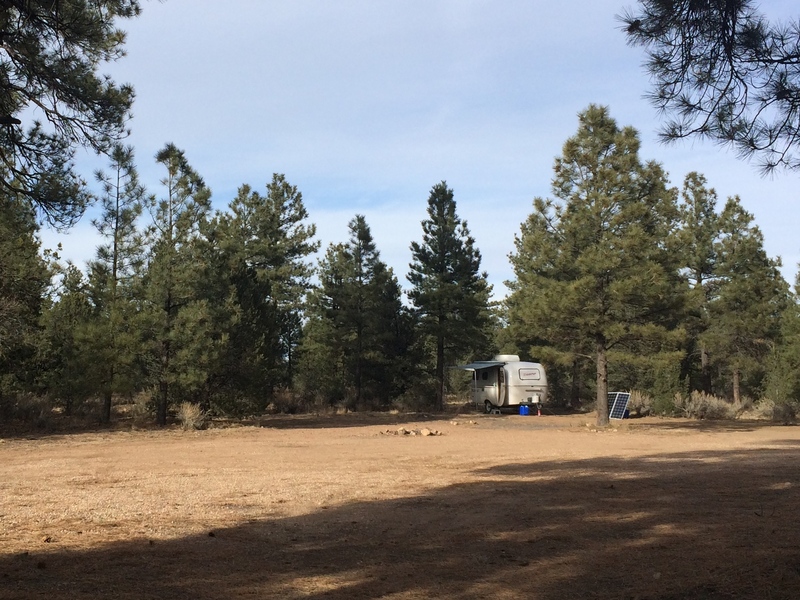 We stayed at a free campsite in Tusayan, a town just south of the Grand Canyon Visitor Center. Yay off-season! 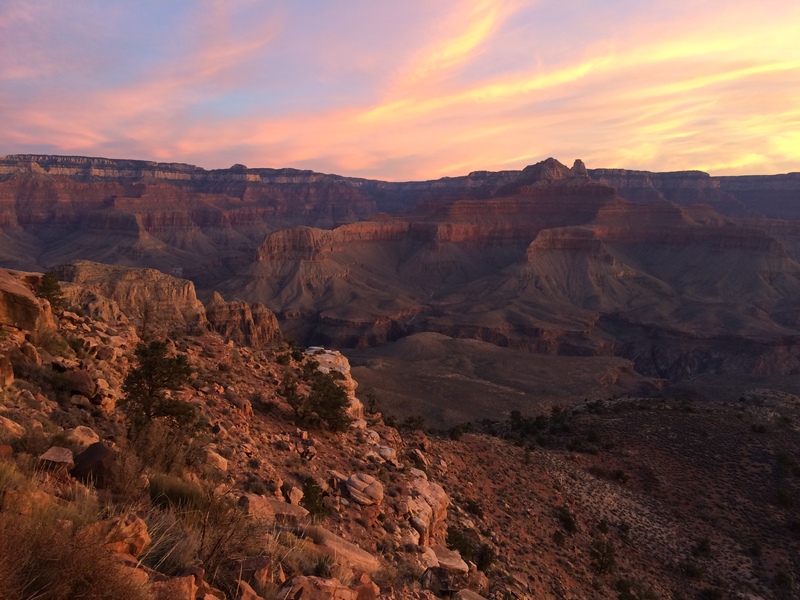 Even after only visiting the Grand Canyon for the first time, I’m going to say that the time period immediately after Thanksgiving and before Christmas is the best time to visit. I overheard park rangers and tour guides telling everyone that those several weeks were their lowest season. Compared to other national parks I’ve visited it was still relatively crowded, but I at least did not have to suffer from the Disneyland-like summer crowds the park typically sees. 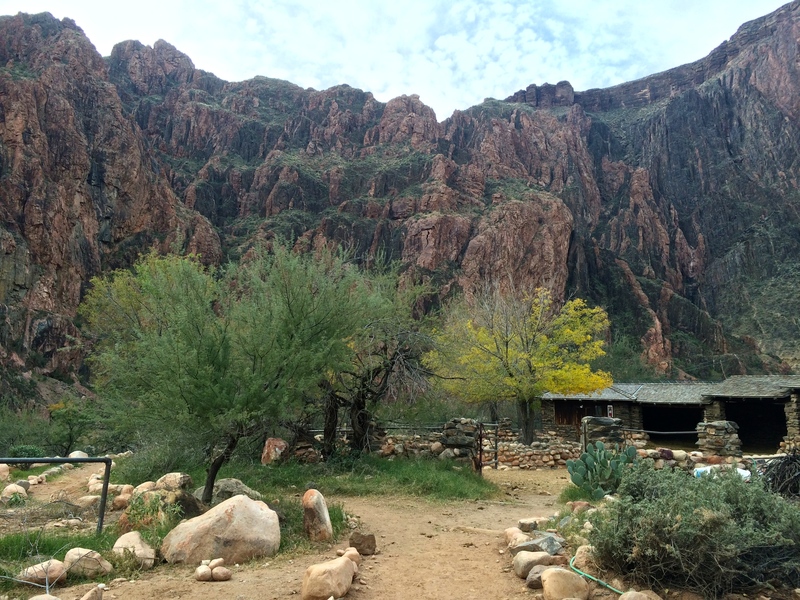 In addition to fairly vacant parking lots and overlooks, daytime weather was also most suitable for hiking down the canyon. Rather than exposing myself to dangerous 100ºF+ temperatures, I cycled and hiked in near-perfect temperatures that never exceeded 55ºF. 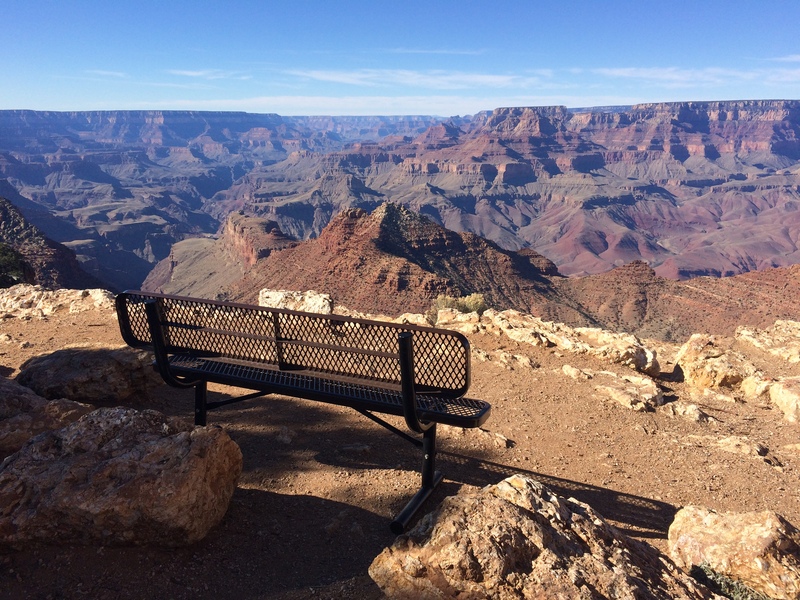 Perfect outdoor temperatures and no crowds at the Grand Canyon? Only in early December! 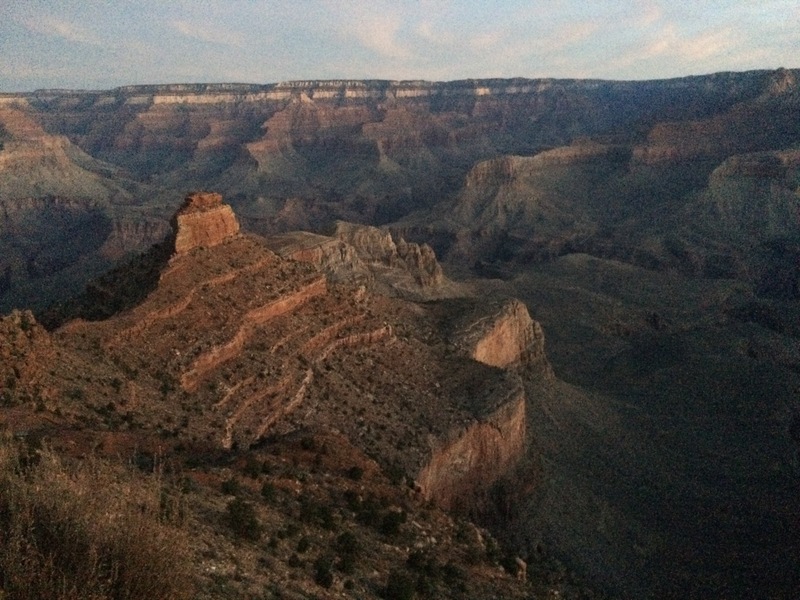 My preliminary days at the Grand Canyon were spent at the numerous overlooks along the rim. 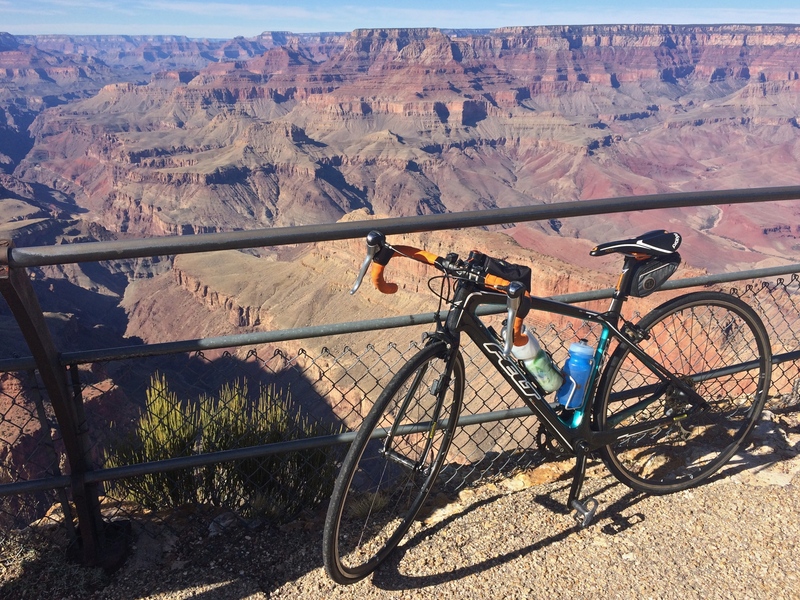 First was a 45-mile bike ride on the eastern end of the park along the rolling Desert View Drive from the main Grand Canyon Visitor Center to the Desert View Watch Tower. Along the western end of the park lies Hermit Road, a 7-mile scenic drive typically closed from March 1 through November 30 to private vehicles. Luckily for me, I was there during the first week of December! This meant no wait times for shuttles and the ability to enjoy each overlook for however long I pleased. Along with the low season and weekday mornings, I enjoyed most overlooks in complete solitude and peace. 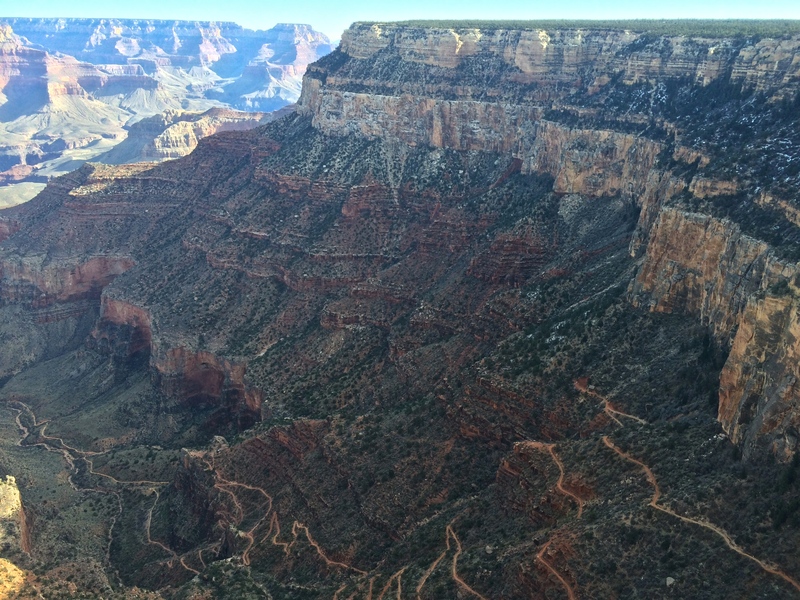 It is said that only ~1% of the 4.5 million+ annual visitors to the Grand Canyon hike down to the Colorado River. 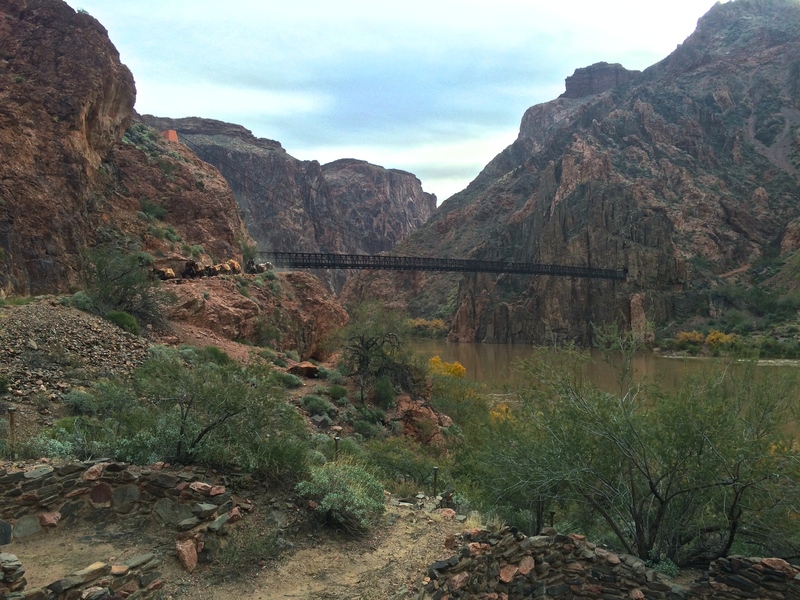 Despite all the overlooks and my 45-mile bike ride, I saved the best for last: a 16.5-mile round trip hike down to the Colorado River and back up to the rim. In the same day. 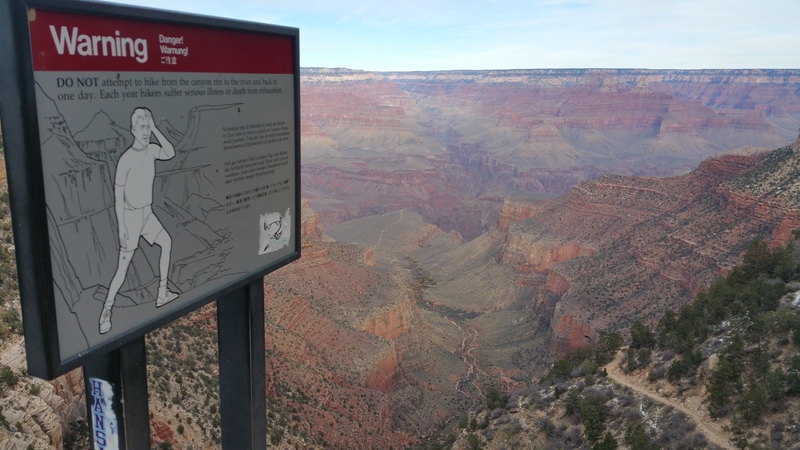 There are signs throughout the entire park advising against hiking down the canyon and back up in the same day, but I know these signs are for the millions of tourists who don’t know their own limits. 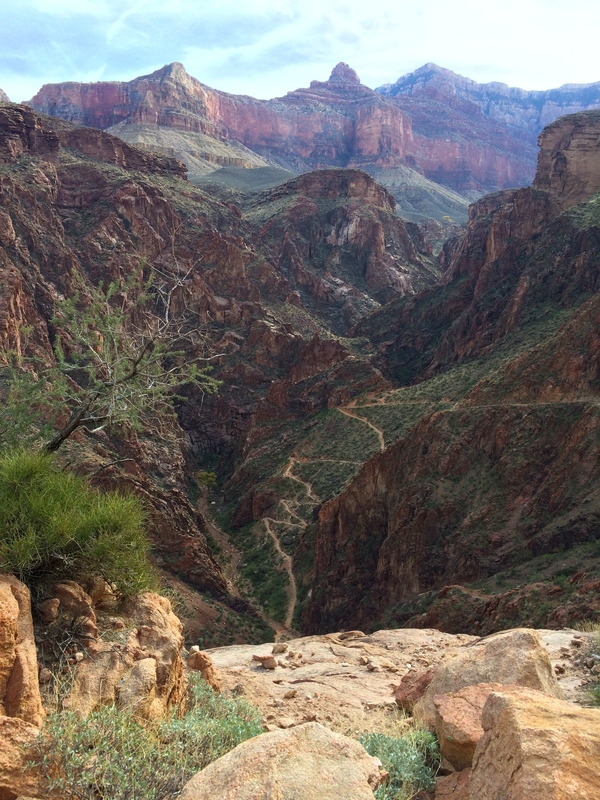 As a first-timer down the canyon, I picked the most straight forward route: 7 miles down South Kaibab to Phantom Ranch and up 9.5 miles via Bright Angel. They say it’s a strenuous elevation gain of ~4,700 ft. over 7 and 9.5 miles, but after comparing the gain over distance with Half Dome, The Paintbrush Divide at the Tetons, The Inca Trail, and Mount Shasta, I realized that this would be my easiest 15+ mile hike in my book. And I was right! 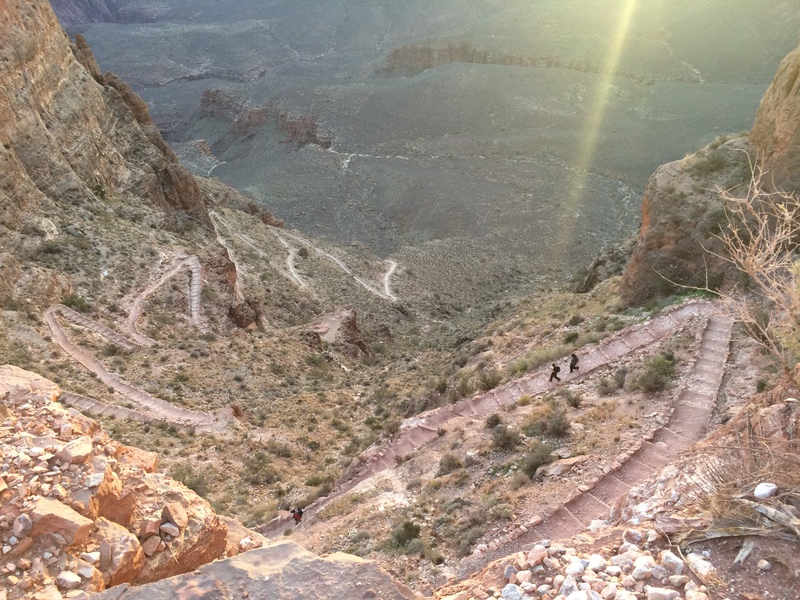 Worried that there wouldn’t be enough sunlight in a day, I began my hike in the dark at 6:30am at the South Kaibab Trailhead. 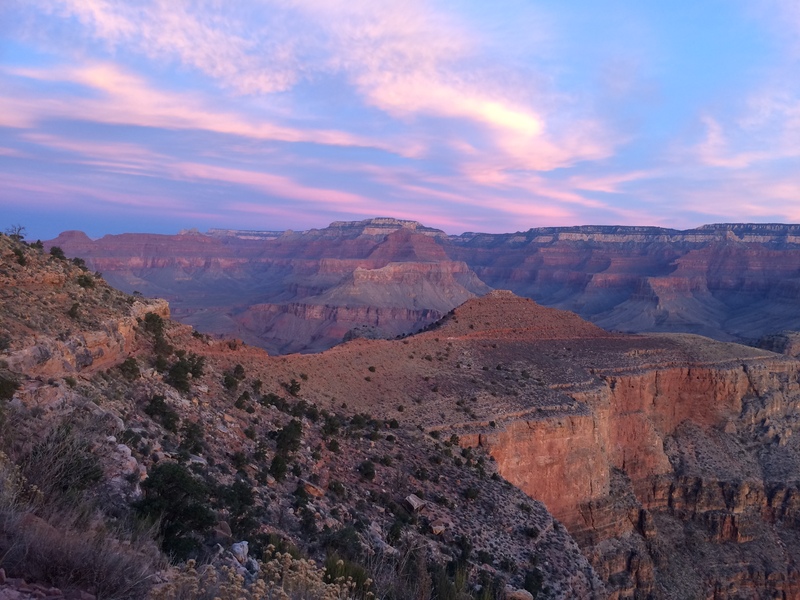 During the 2 hours and 45 minutes it took me to get down to Phantom Ranch, I watched the Grand Canyon fill with light and the sky change hues at sunrise. 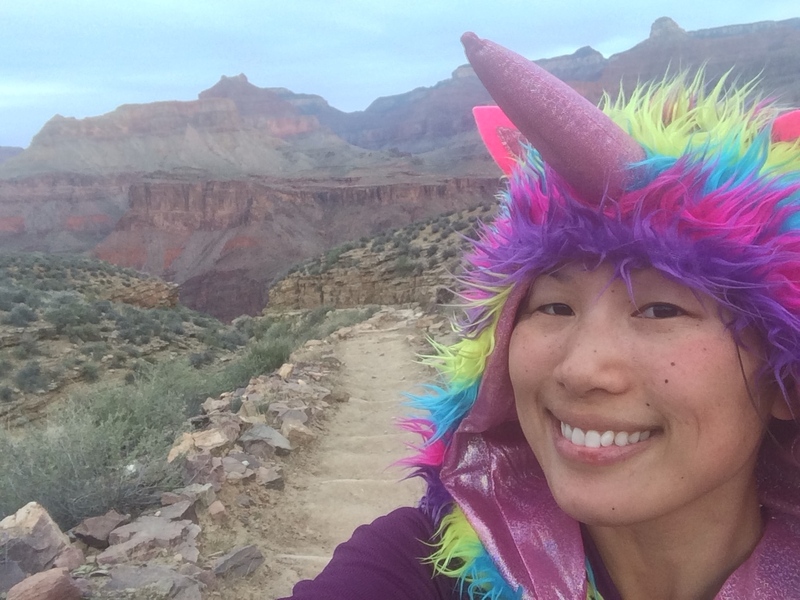 To keep myself (and others) mildly entertained I wore my unicorn hat. 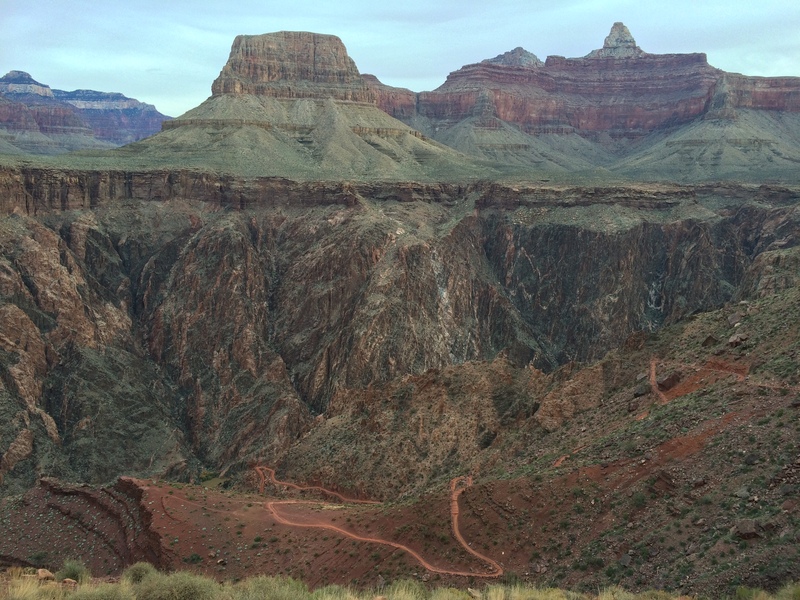 These were the only other people going down Kaibab–a man with two teenage boys. Aside from them, I enjoyed the trail all to myself. 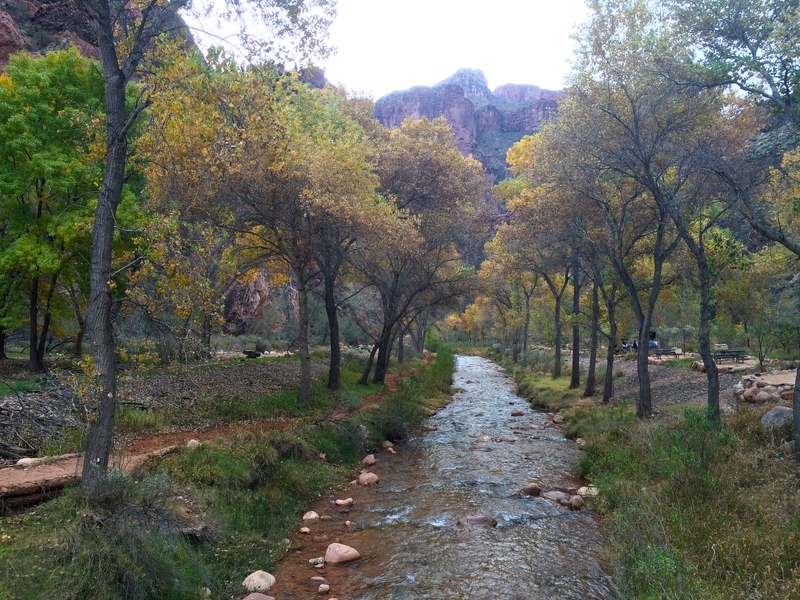 Phantom Ranch was pleasantly filled with green shrubs and trees, as a small stream flowed right through it. 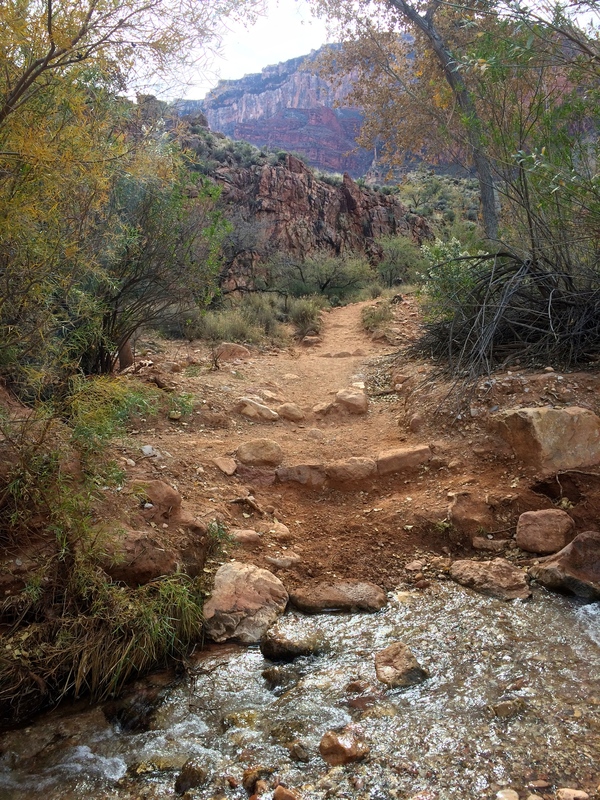 After a 45-minute break at Phantom Ranch, I continued my hike to the Bright Angel Trail. 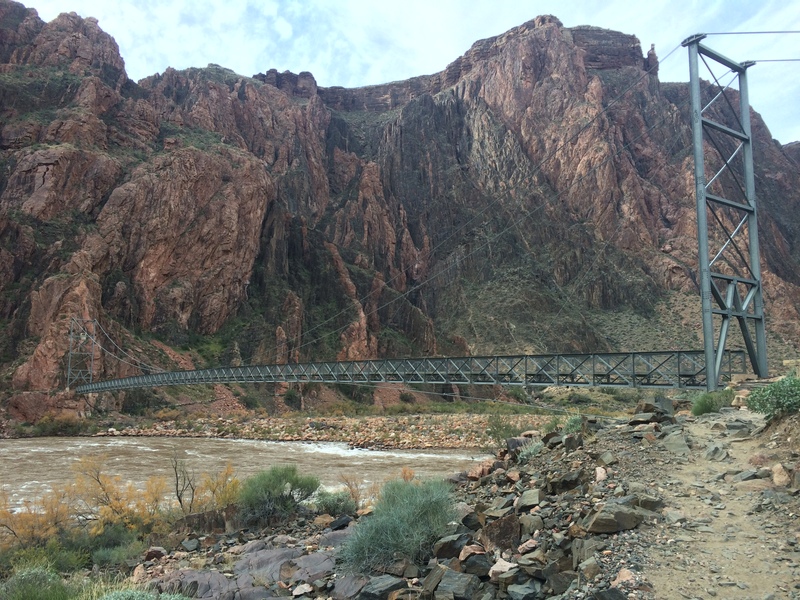 I crossed the Colorado River again. 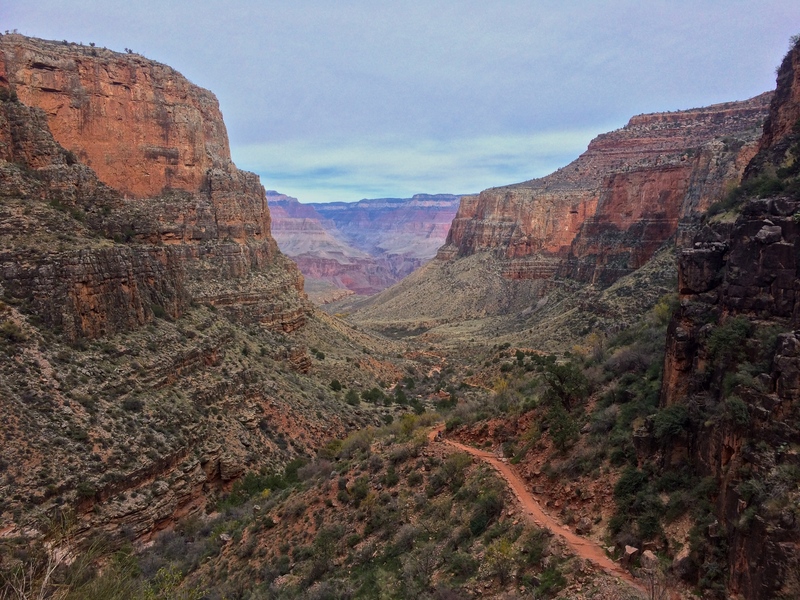 The canyon-enclosed Bright Angel Trail was much greener than the fully exposed South Kaibab Trail. Obviously there was more green because there were several streams and creeks. 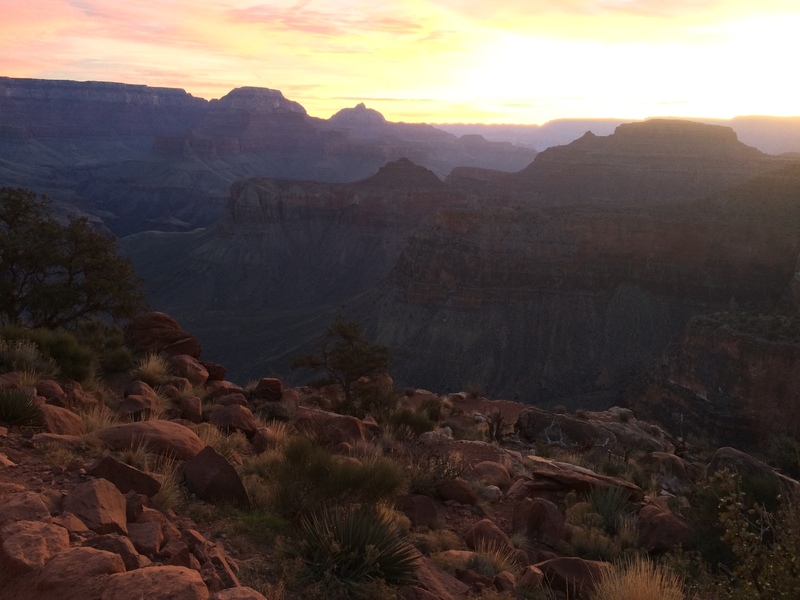 It was 3pm by the time my feet touched the rim of the Grand Canyon, exactly 8 and a half hours since I started my hike. 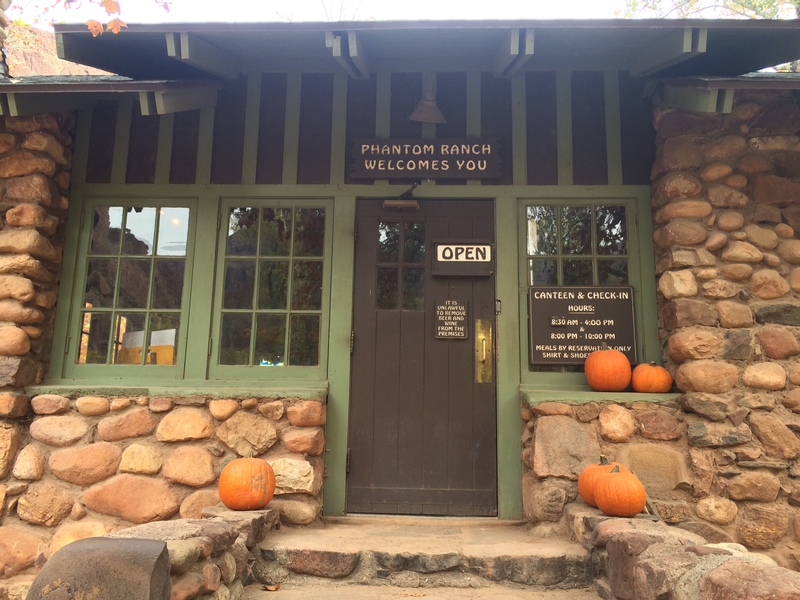 Excluding the 45-minute break at Phantom Ranch, it took me 7 hours and 45 minutes to hike rim to bottom and back over 16.5 miles. 2 hours 45 minutes down, 5 hours back up. Was it difficult? Not if the temps are cool and if you’re an experienced hiker. The key is to not hike it in dangerously hot temperatures. But still every year hundreds of inexperienced hikers attempt to do this hike in extreme heat, resulting in costly rescues. 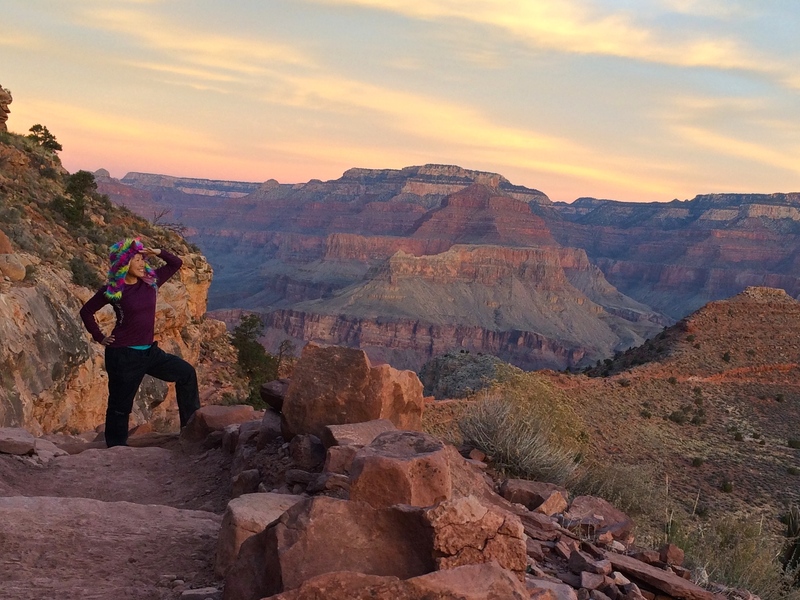 It is thanks to these tourists that park rangers discourage this hike in a single day. 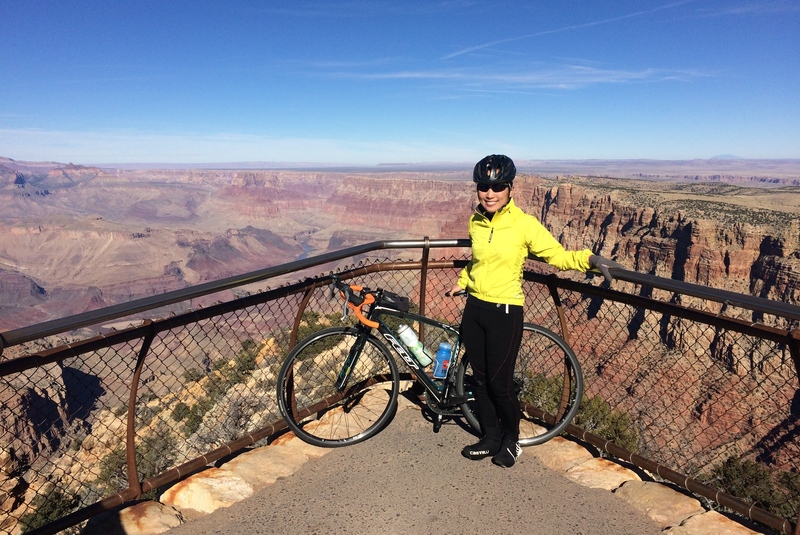 My legs were sore the next day (and the next several days) when we departed the Grand Canyon. Even after we left, we saw the Colorado River one last time. 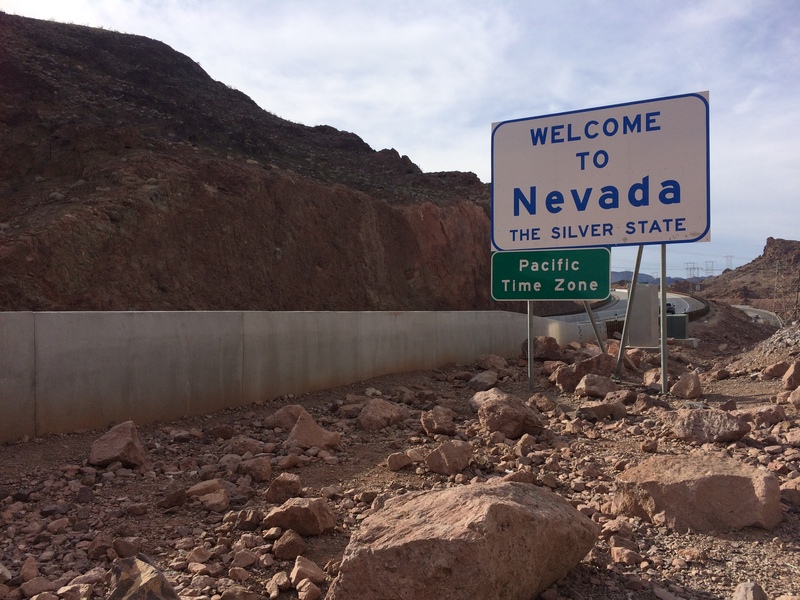 Straddling the border of Nevada and Arizona was Hoover Dam, a civil engineering masterpiece. I often wondered if the Grand Canyon was worth the hype, if it was worth the tour bus lines, tours, and loud tourists with selfie sticks. Like Yosemite, the majestic beauty leaves such a lasting impression that not even the bustling crowds can damage the experience. And like Yellowstone, coming at the right time during the low season makes crowd control not an issue at all. It definitely lives up to its name; it is grand after all. 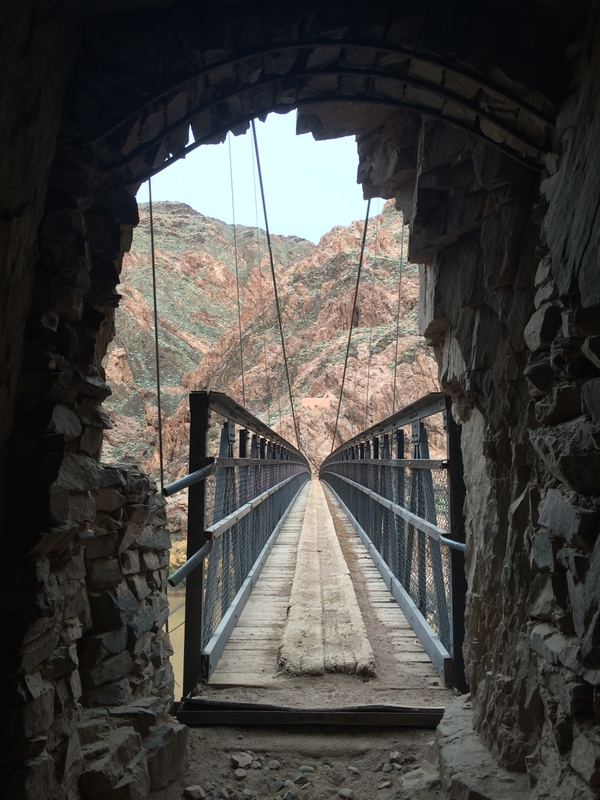 This entry was posted in Arizona and tagged bright angel, glen canyon dam, hoover dam, south kaibab. Bookmark the permalink.